It was quite a while since I visited Paaspop. This opener of the Open Air Festival period is already a classic where for some it is more “You need to be there” than You need to go and see ...”. I’m still in the category that goes to a festival for highlights in the line-up. In this case the ones mentioned in the title. Of course there were other interesting shows as you will read. Some say a Sunday is not the right time for a big gig. The show in de Melkweg in Amsterdam proved that that is not correct. When arriving for the Heroes on Tour Europe 2015 of Sabaton (Sweden) with special guests Delain (Netherlands) and Battle Beast (Finland) I was happy that I get a quick pass through instead of having to wait in the enormous queue until Leidse Plein (passing the camouflaged tour bus). Doors opened at 6:30PM and there was loud cheering from the first people entering the venue. They still had to wait until 7:30PM for the first activity on stage but that didn’t matter. The sold-out house made up for a big party. The venue for tonight is the recently opened Poppodium Doornroosje. As it is in the city center almost next to the station, public transport was to way to go. 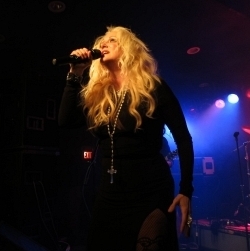 The show was sold out, when arriving already a great crowd was waiting for the doors. 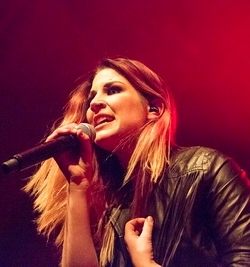 As Serenity and Delain played more often together the “interest” of the audience is mixed. 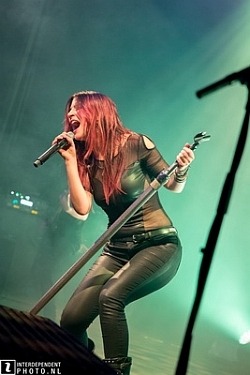 Clearly there were quite some fans that would have preferred Delain to be support. As regular visitor of gigs it’s not that hard to wait as you see a great number of known faces of die-hard Female Fronted Metal fans.